Chris jams a luscious, long-anticipated Xbox exclusive whose development stretches back to the '30s. 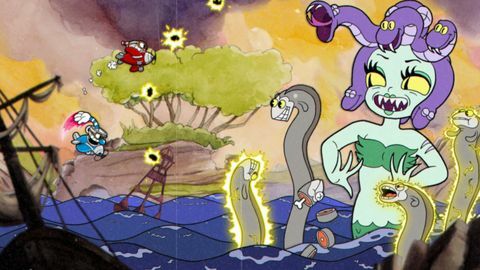 Cuphead begins with the most charming of intro sequences, presented in the game's loving homage to retro 1930’s animation. It has a dark edge, but it does not prepare you for the onslaught to follow. 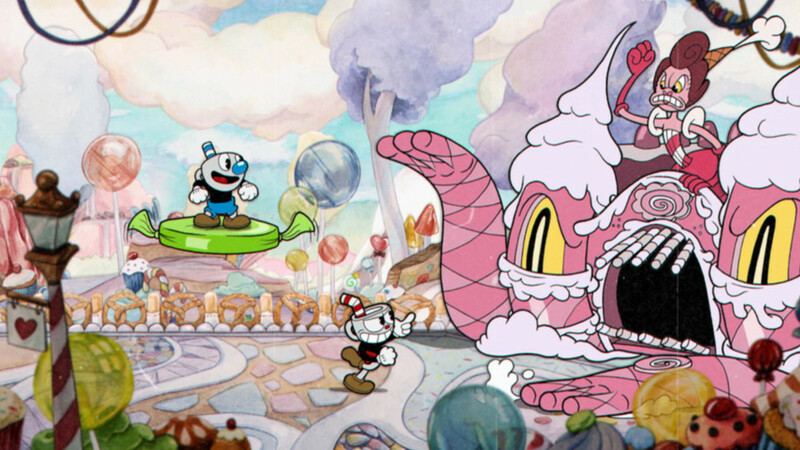 Cuphead and Mugman lose big in the Devil’s casino, and after some begging, are granted a chance to work off their debt by collecting the souls of overdue debtors – the game's wildly inventive and surreal bosses. The presentation is nothing less than breath-taking; Cuphead is easily 2017’s most visually striking game. Studio MDHR has so perfectly captured the look and feel of its '30s cartoon inspirations that I was almost surprised a hideously offensive archaic racial stereotype didn't pop up as a boss. 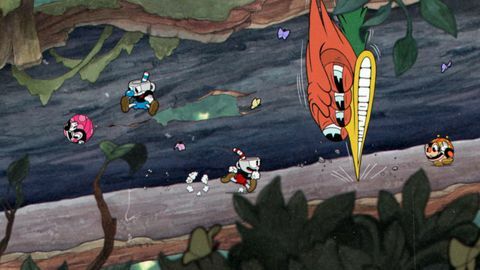 The game's animation frames, oversaturated colour, and softness perfectly capture the distinct look of early Disney and Fleischer Studios cartoons, and this almost obsessive dedication to authenticity carries over to Cuphead's swingin' jazz soundtrack as well. Both visuals and audio feel like they have been created 80 years ago, and they wear those decades of history like a dust-heavy cloak, which just adds more character. So Cuphead is jaw-dropping, but also thumb-destroying. For all its beauty, it is also the embodiment of digital masochism, both in terms of its punishing difficulty and its ability to turn digits into raw nubs of barely-functioning flesh. Despite the pain, you will feel compelled to play. It's something of a "boss rush" shooter, except it is broken up by a bright overworld with the odd secret strewn about, and also some more traditional side-scrolling levels that have more of a platforming emphasis. These can be hectic, and are no less deadly than the bosses themselves: you blast away at all manner of strange anthropomorphic enemies, dash out of the way of trouble, and parry certain special projectiles to build your super attack meter. These platforming levels also add some much-appreciated variety to the game, and give you the opportunity to collect currency to increase your offensive and defensive abilities. Upgrades available in the overworld's store range from various projectile attacks and a much appreciated teleportation dash to more powerful super attacks, and much more. All that serves as some preparation for the boss fights, during which you’ll be thoroughly tested. Every boss has multiple evolutions, and the usual variety of scripted attack patterns mixed up to make memorising them a little more difficult. Death is a constant visitor, but strangely, frustration much less so. For while the game is hard – at times infuriatingly so – it is never strictly unfair. Every evolution of a boss gives more than enough openings, and while there are some bullet hell elements and tricky platforming challenges, the game gives you every opportunity to improve your skills to be able to tackle them. The skill ceiling is high, though, and increases as you unlock each of the game's four worlds. No doubt some will find they have reached their peak well before the final boss. However, with perseverance it's possible to navigate its pits, platforms, and projectiles. There is a real sense of achievement when you finally kill a boss, and it is this never-diminishing satisfaction this drives you forward with the next challenge, no matter how many times it almost triggers a controller flinging outburst. 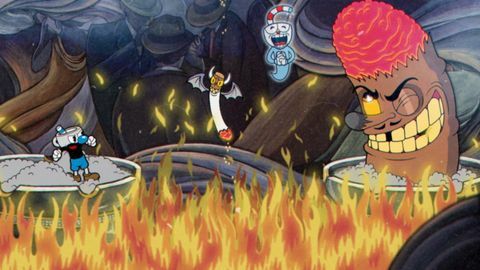 My only real issue with Cuphead is that it can feel rather repetitive. The platforming sections help to break things up, as do the bosses where you pilot a plane and the game briefly becomes a horizontal shooter. Nonetheless, I still had boss battle fatigue by the end. This is more of a pacing issue than anything else, and no amount of the visual variety on offer could alleviate it. It will likely be exacerbated by players struggling to cope with the game’s difficulty too. But thankfully after taking a couple of days off, found myself recaptured by everything Cuphead does so very well. Ups Exceptional art direction. Wonderful sound design. Fantastic music. Pixel perfect precision. Endlessly imaginative boss design and variation. Unrelenting, but rewarding difficulty. PC version will run on a potato. Downs Repetition becomes an issue towards the end. Difficulty will put off some, and infuriate others.